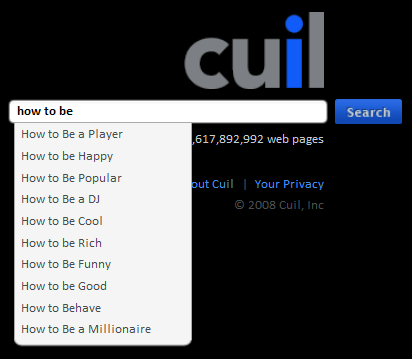 One of the few things that are interesting about Cuil, the search engine launched two days ago, is the query suggestions feature. 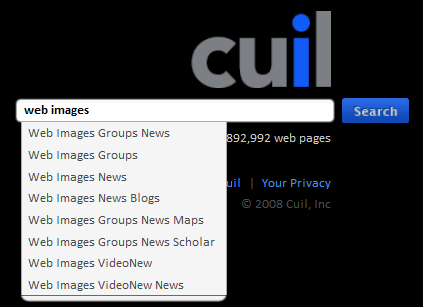 Most search engines suggest queries using a list of popular searches, but Cuil didn't have this option. The site obtained the suggestions by compiling a list of n-grams from web pages. For example, if you type "web images", you'll get a lot of variations of Google's navigation bar. A Google search for "web images * * *" returns similar results. 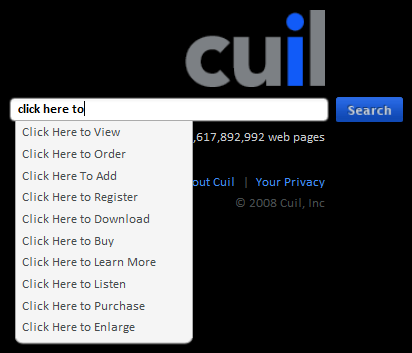 http://www.cuil.com/suggest?q=click here (replace "click here" with your search). You'll notice that the results are very different than the suggestions from Yahoo, Google or Ask. The unique look is interesting, however, I am not impressed with the functionality. I searched for "east coast beach vacation rentals" and it replied "no results" "shorten your search phrase" - are you kidding me!!! I am not sold on this one yet. Thanks for the info though. Actually, the look of cuil totally irritates me. I have tried their 2 column layout and their 3 column layout and found both very irritating. I don't like its layout myself. I prefer linear layouts like that of http://find.com - simple and straightforward.